How YOU can dive the gear!! Get "in-depth" with historical gear! Ever wonder what kind of equipment a modern commercial diver uses? 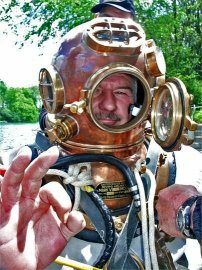 How does a copper helmeted diver feel like with all that heavy vintage gear on? Want to dive with weighted boots on instead of fins? Discover a unique diving experience with the NEDEG! There is no charge for participation at an NEDEG Rally (other than the admission to the respective dive park the Rally is held at). A small donation to the NEDEG is highly appreciated. Any donations received will be used offset the costs for equipment maintenance, gear purchases, fuel, and other operating expenses. The basic requirements to dive are a current C-Card (SCUBA Certification Card), and the general healthy physical and mental ability to handle the gear. We make no guarantee of time or equipment availability, but will make a sincere effort to provide qualified divers with a recreational underwater experience with a helmet. NEDEG diving experiences are limited to open circuit air diving at a shallow depth. To dive a modern commercial diving helmet, NEDEG requires a certain level of participation and instruction. 1. Get familiar with basic hardhat setups through a basic equipment familiarization session. 2. Participate as a tender dressing at least one other diver in the gear you will be diving. You will also learn the basics of diver tendering, communications, and umbilical management. To dive the Mark V helmet, Chinese, or Russian helmet (or any other equivalent heavy rig) NEDEG requires a certain level of experience, participation and instruction. 1. Have previously made a surface supplied dive in a lightweight commercial helmet setup (see above). 2. Participate as an Mark V dive tender dressing and assisting at least one other Mark V diver. We've found that this makes the heavy gear dive less "overwhelming" by getting the new diver familiar with both the equipment and the underwater environment of the quarry. This procedure is handled on a time-available basis, so at least one full day of participation is usually required when diving heavy level gear. In addition to diving the equipment, we always appreciate help in handling the gear and tending the dive site for others. The diving equipment is all privately owned and made available on a voluntary basis, so respect for the gear is expected, and all decisions of the equipment owners are respected. We try to maintain a friendly atmosphere on the dive deck but expect the participants to keep in mind that diving is serious business where safety is our foremost concern. 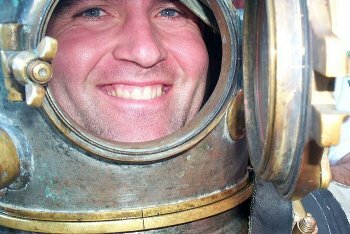 However, that big grin when your faceplate is opened after the dive makes it all worth the effort!